Aboriginal Australia has had a deep relationship with the waters surrounding the island continent over thousands of years. This saltwater is home to many unique plants and animals. 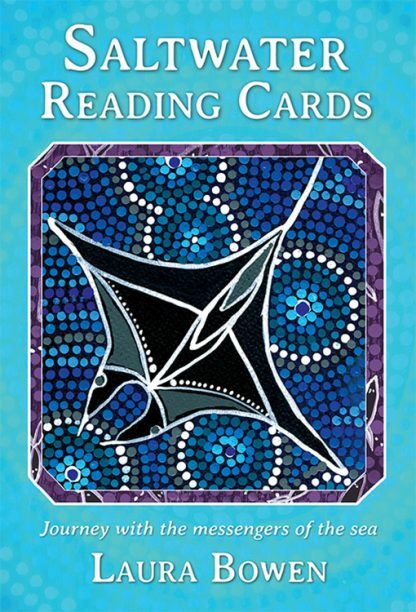 This beautiful set of 36 cards will introduce you to the ancient wisdom that is the very spirit of Australia. Readers will have the opportunity to discover valuable insights into their personal lives. The spirits of Saltwater will share their knowledge through this wonderful set of revealing messages from the sea. The detailed explanations and interpretations throughout the accompanying booklet will guide your understanding and offer ways to work with these wisdoms in your life. Laura Bowen is a contemporary artist and storyteller; her indigenous connections are to the Worimi and Biripi people of the manning river area of NSW, Australia. Laura has a strong connection to Country, especially the valley where she was born and she conveys this through her writing and art. Her artwork speaks of her understanding and connection to place, the Australian environment and the spirit world. Laura�s love of color and her observations of the flora, fauna, sacred spaces and natural cycles are evident in her art and her written word. With a keen interest in intergenerational learning and teaching, Laura shares her connection to place and her Aboriginal culture and spirituality through her card decks, speaking opportunities and workshops. Laura is the creator of Dreamtime Reading Cards published by Rockpool Publishing in February 2015.